Pokémon GO Sableye (Max CP 1305) is the first dual dark ghost typed Pokémon, albeit not a great one. Sableye is a glass cannon with a few good movesets (Shadow Claw/Foul Play). Sableye is one of the first Gen III Pokémon to be released for Halloween 2017. Sableye is only weak to fairy attacks, but unfortunately, it’s stats are holding it down, especially it’s super low stamina. With 1305 Max CP, Sableye is not a good candidate for Gym defense, but it can be used as a throwaway Ghost type glass cannon in offense and raids. 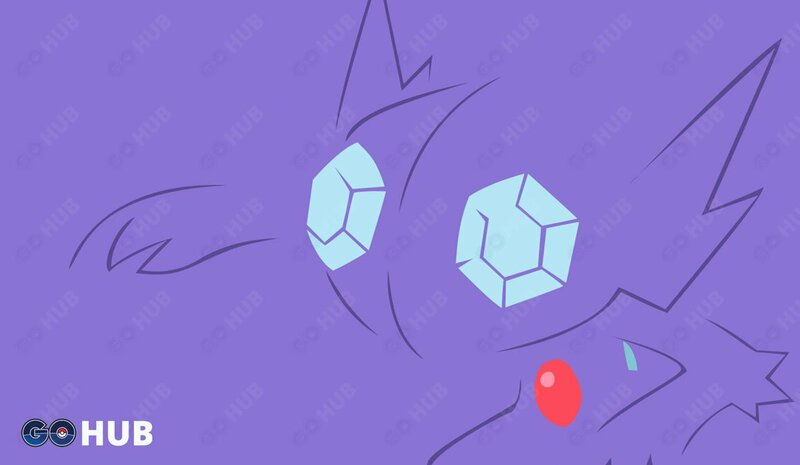 With Shadow Claw ghost and Foul Play dark, Sableye can be effectively used as a second team option (or Pokémon fodder) in Gengar and Alakazam raids. Sableye has only one type weakness: fairy. Sableye is known to have a mega evolution. With it, perhaps Sableye will have a better chance to climb the ranks. For now, Sableye is only good for collection. Sableye has access to a good variety of Dark and Ghost moves, including the fabled Shadow Claw — a super quick, high DPS ghost quick move. The overall best Sableye moveset is considered to be Shadow Claw / Foul Play, as it benefits from dual-STAB, has Shadow Claw and a two bar Foul Play as charged move. A normal Sableye has dark purple body. Its eyes resembles a pale blue gemstone. It has a red gemstone on its chest. It also has a blue, green, and another red gemstone structure on its back. Pokémon GO shiny Sableye has a yellow body. Its eyes resembles a white gemstones. It has a green gemstone on its chest. It also has a light green, orange and another yellow gemstone structure on its back. Sableye made its television debut on the 303rd episode of the Pokémon series (Advanced Generation: Episode 29) titled, “Ready, Willing, and Sableye”.